Contrary to what you would expect, geranium bourbon essential oil is derived from a plant that belongs to the Pelargonium, not the Geranium genus of Geraniaceae. Back in 1737, the father of modern botanical nomenclature, Carolus Linnaeus, combined the entire genus of the Geraniaceae together in his epic work ‘Species Plantarum’. Although all the genera were later separated, the term ‘geranium’ had become so well established with Pelargoniums that it is still in common use today. There are approximately 250 natural species of Pelargonium, with thousands of hybrids and cultivars, although surprisingly few of these species have a truly pleasing fragrance. Pelargoniums are believed to be of South African descent, but due to massive hybridisation after their introduction to Europe in the 17th century they now bear little resemblance to their original parentage. During the 18th century, hundreds of these European hybrids were returned to South Africa, and were later introduced to Algeria, Australia, Comoros, India, Israel, Madagascar, Morocco, Reunion Island and North America. 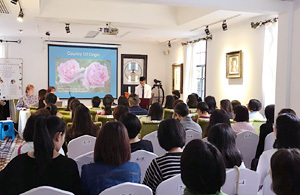 Much later in the 1940’s pelargoniums were introduced to the Yunnan province of China, which still remains one of the largest geranium oil producing countries. The principal species which were originally used to develop cultivars for the production of geranium essential oil are P. graveolens, P. capitatum, P. radens and P. odoratissimum. Although the leaves of P. odoratissimum (Apple geranium) have an agreeable odour, the extracted essential oil has a distinctly musty note that is quite unappealing when compared to other varieties. Botanical experts Demarne and Van der Walt determined in 1989 that geranium ‘Bourbon’ essential oil originating from the island of Réunion is produced from the leaves of a hybrid of P. capitatum and P. radens. This cultivar is identified as Pelargonium graveolens cv. Rosé, and is also known as Pelargonium roseum asperum cv. Bourbon. In fact, the geranium Bourbon essential oil from Reunion has gradually become the new reference by which all other geranium oils are judged. Although this essential oil was originally produced exclusively on Reunion, more recently the Rosé cultivar used there has been grown commercially for the production of ‘rose geranium’ oil in other countries, including Africa, Egypt, Madagascar and Zimbabwe. 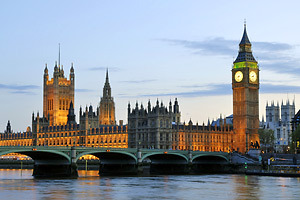 Confusingly, the oil from these regions is sometimes referred to as ‘Bourbon type’ geranium oil, so buyer beware! Geranium Bourbon essential oil from Reunion commands a higher price than geranium essential oils from other regions, so be sure you are getting exactly what you have paid for. The Rosé cultivar is a non-hardy, perennial shrub, with an upright habit that can reach a height of 1.3 metres (4ft 3ins). It has an extensive root system and copious grey-green stems that darken and harden with age. The grey-green leaves are variable according to climate and soil conditions, but are typically 70 mm in length, deeply lobed, pointed and highly fragrant. Flowers are small and grouped together in dense clusters, and are rose-violet coloured with darker stripes. In Reunion, the blossoms appear during spring and again in August or September, bringing with them the same beautiful fragrance as the leaves. The oil content of the flowers is less than that of the leaves. The plant has a wide range of medicinal uses, although documented ethnobotanical citations are difficult to find. The references in most aromatherapy books actually relate to the British plant Herb Robert (Geranium robertianum) and the American Cranesbill (Geranium maculatum) and not P. graveolens. In African folk medicine, the non-hybridized form of this plant was considered to be astringent, antifungal, anti-inflammatory, antiseptic and styptic. The Sotho made a paste made from the leaves to staunch bleeding and treat wounds and abscesses. The roots were also used in a decoction to wash patients suffering from fever. Other external uses for the leaves includes treating neuralgia, throat infections and a wide range of skin conditions such as ringworm, ulcers and rashes. An infusion was taken internally for diarrhoea, dysentery, colic, gastroenteritis, haemorrhage, menstrual problems, kidney and bladder disorders. The essential oil content of the leaves increases as the flowers reach full bloom, therefore this is the ideal time for harvesting the plant. In Reunion, the cutting is done in the morning during dry sunny weather, usually by hand since the steep slopes where the crops are mainly grown are not conducive to mechanical harvesting. In areas where mechanical cutters can be used, the stalks are collected along with the leaves. Although there is very little oil content in the stalks, the leaves can not be harvested alone mechanically. Extraction of geranium Bourbon essential is achieved by steam distillation of the leaves and stalks. The resulting oil is a pale olive-green colour with a sweet, leafy rosy fragrance with a minty and slightly fruity overtone. 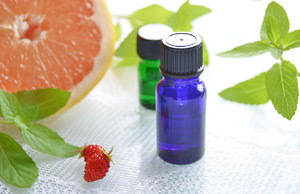 Geranium Bourbon oil is considered a middle note in aromatherapy. Like all species of geranium essential oil, the Bourbon type is balancing and regulating to both body and mind; used in skin care it normalises sebum levels in dry or greasy skin and promotes cell renewal, whilst on the emotional system it stabilises anger, depression, irritability, nervous tension, PMS and all forms of roller-coaster emotions. It is also an effective adoptogen, which means that it strengthens the body’s immune, glandular and nervous systems, thereby increasing resistance to stress. It is an absolutely indispensable oil. Geranium Bourbon essential oil makes a welcome addition to any blend since it adds a lovely floral note, without the usual floral oil cost! 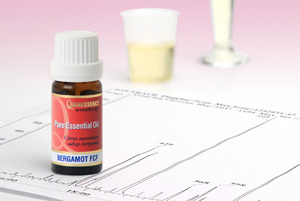 Many aromatherapists prefer to use this geranium oil since it blends so easily with a very wide range of other oils. Try mixing it with basil, bergamot, black pepper, cedarwoods Atlas and Virginian, chamomile Roman, citronella, clary sage, clove, jasmine, juniper berry, lavender, neroli, patchouli, peppermint, petitgrain, rose, rosemary, sandalwood, vetiver and all citrus oils. 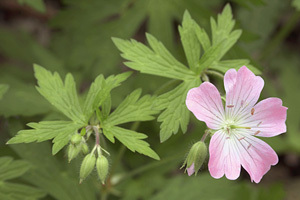 You may read in some aromatherapy books that geranium oil can cause contact dermatitis in hypersensitive individuals. As is often the case in poorly researched aromatherapy books, these reports appear to have based from the action of the plant, and not the essential oil. Good quality, unadulterated geranium oil from any origin is well tolerated by the skin when used at normal levels. The first Pelargonium recorded in history was in 1672. The German botanist, Paul Hermann, collected a sample of Pelargonium cucullatum he discovered growing on the Table Mountain of South Africa. Above: A crop of Geranium Bourbon (Pelargonium graveolens cv. Rosé) growing in Reunion. The term ‘Bourbon’ is used because the island of Reunion was known as ‘Ile de Bourbon’ (Island of Bourbon) until 1793 when it was renamed by the French. 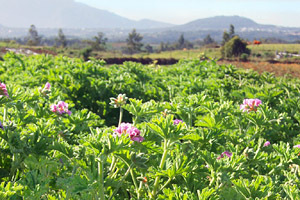 Although geranium 'Bourbon' is now cultivated in other countries, most experts agree that the essential oil produced in Reunion is superior to all others.